ORIGINAL SONG: "Santa Lucia" was a traditional song in the Neapolitan language, describing the appeal of an evening boat trip on the harbor in the Borgo (district of) Santa Lucia of Naples; it became a popular song after its translation into Italian by Teodoro Cottrau in 1849; it was the first Neapolitan song to undergo such a change during early enthusiasm for Italian reunification. It has been performed and recorded (links to Youtube) by many operatic singers e.g. Caruso, Lanza, Pavarotti and Bocelli, and also by Elvis Presley. PARODY COMPOSED: Giorgio Coniglio, January, 2018. (The skeptical reader may surmise that the substituted lyrics are, in fact, about food intolerance), but the Italian setting and song make for a more enchanting experience. In the original Italian song, each pair of lines is repeated, making the verses nominally 8 lines long. For simplicity, the repetitions are not included here in the parody-lyrics. WORDPLAY LINK: An expanded version of these lyrics, slightly modified to suit the format, form part of a poetic submission on our sister blog "Edifying Nonsense" entitled Limericks About Food Intolerance, posted in February 2019. SONGLINK: Check out an earlier post on this site entitled "Singable Limerick-Medley #19: Eating Italian" for other singable aspects of italian food. 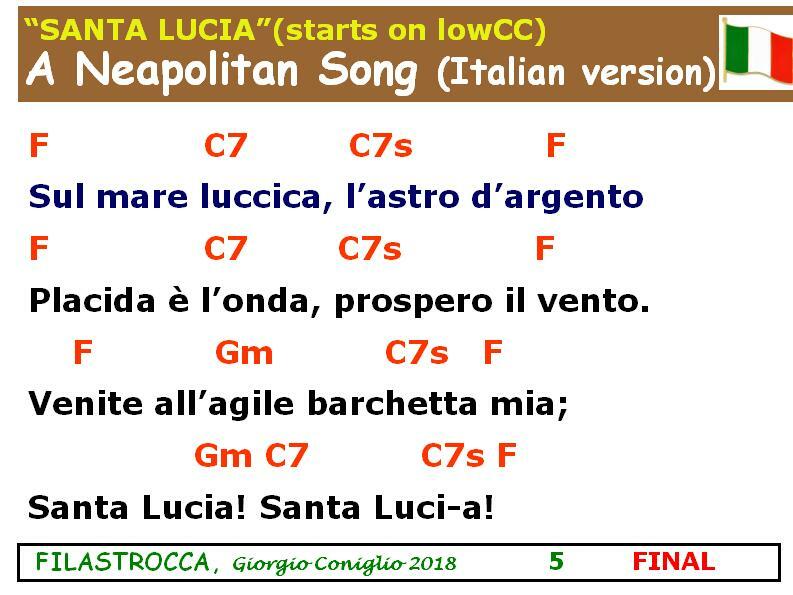 Also, the story of the original clean Nantucket limerick can be retold using the "Santa Lucia" melody, among others - see "Novel Melodies for Singing Limericks". Filastrocca: Italian for "nursery rhyme', 'fable','doggerel', or 'rigmarole'. Placida è l’onda, prospero il vento. “Flatus: such awful gas; gelati? I’d better pass." Bought a bakery(a) , now lives lactose-free-a. Reprise: Where is Gino? Let's look and see, ah! I should call it quits, and .. exist gluten-free-a." Now he'd start up Pisa's 'Lean Trattoria'.